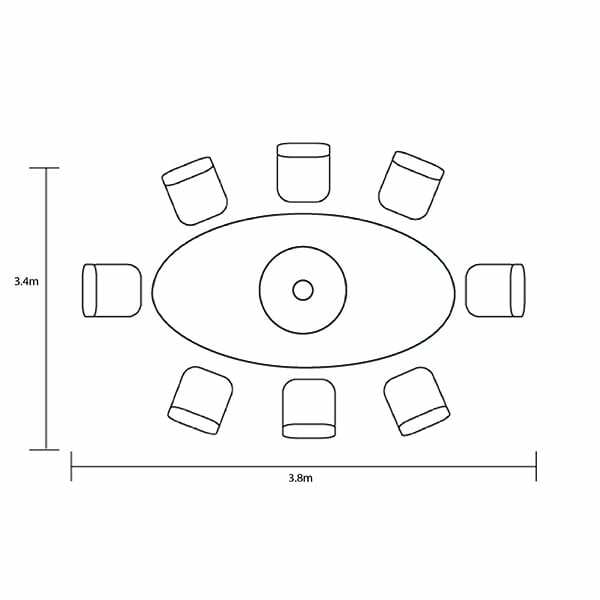 Hosting your family and friends with the Heritage eight seat elliptical dining set will be an impressive social affair. Our grand, oval table is crafted from resin weave, hand woven over a light but strong aluminium frame and finished with a tempered glass top. This same craftsmanship is applied to the included Lazy Susan - adding further ease and elegance to your entertaining. Eight generous sized dining chairs provide extra comfort and support with their high backs and arm rests and come with our comfortable back and seat Weatherready® cushions. These cushions can be left outside during summer months, whilst the table and chairs can live outside all year round. This set comes with a 3m Round Premium Parasol, 15kg base and coordinates beautifully with other dining and lounging options in the full Heritage collection.